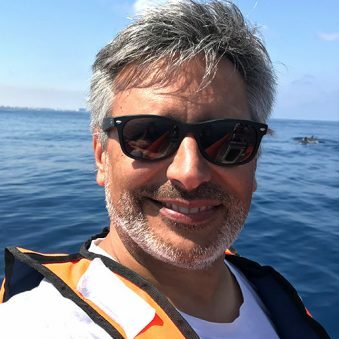 Dr Manel Gazo is the Director of SUBMON, a marine conservation organisation based in Barcelona, and also Associate Professor at the Department of Evolutionary Biology, Ecology and Environmental Sciences of the University of Barcelona. He obtained his PhD in Animal Biology in 2002 and also holds a MSc in Marine Aquaculture and a MSc on Direction and Management of NGOs. He is an external consultant on Marine Mammals for UNEP MAP- RAC/SPA. Manel’s professional experience has evolved around three main areas: management of conservation programs; studies directed towards the protection of marine species and habitats; and direction and management of environmental organizations. He is an active member of the European Marine Sciences Educator Association (EMSEA), aiming to spread Ocean Literacy among Mediterranean countries. Within SOPHIE Manel is helping to give advice on marine conservation topics in the citizen science programs developed for marine tourism operators and their customers. This project will create awareness of Oceans and Human Health issues in the tourism industry.